When the lock was finally made bare to the eye, so too were ropes of golden chain. In each link sat magicks that had interwoven and twined together in one very foreign strand. A very old and well schooled mage could make out the words and pieces of this spellcraft, but most others couldn't even come near to calculating such a thing. Matter, Time and Space had come together and used their own powers intertwined to see this done. Once undone, the lock shattered, and the chains began to fall away, the magick itself unweaving and winging unfettered into the night. It didn't make it far, certainly not out of the circle. A word, snarled and shouted to the bare night sky from the priestess, those magicks were engulfed in utter abyss and pulled inside the pool of shadow. The winds blew over the key wielder, the dragon and the priestess, reaching a howling peak. Slowly, the blood that had outlined the ancient design carved into the stone began to stir. With that stirring, so came the deep and notable rumbling of the Earth beneath their feet. Aska remained absolutely relaxed and still, and that calm was extended to Mura. It would be a test to see if the key wielder would be able to staunch his impulse to run and instead, stick around. The blood surged through the design, but it rapidly became noticeable that said blood was beginning to disappear somewhere. Sharp eyes might be able to tell that it was disappearing into that writhing bit of shadow that had been unlocked, but only if they were very sharp and attentive. Meanwhile, the portal had become reconnected, led out of it's forced isolation. 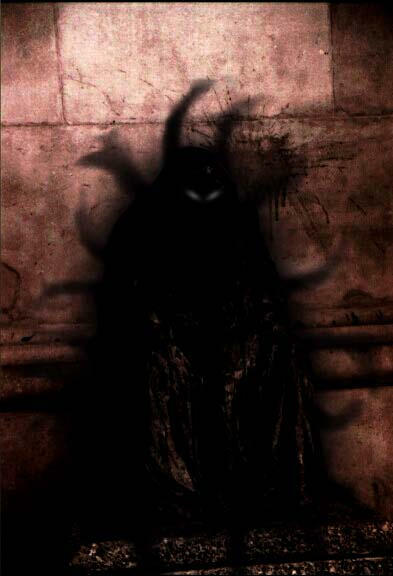 The abyssal shadows reached out as if they had formed into a giant hand, but it was fairly harmless as the only individual standing nearby was, in fact, the priestess, and she knew well that those shadows wouldn't harm her in the least. In the distance, as the rumbling intensified, a resounding crack echoed through the entire city and outward. Aska spoke in quiet Latin to her protégée. "Kneel, little sister. My lord comes." Those changing eyes looked back at the key wielder, if he was still there, moving to English once more. "You would be wise to kneel, wielder. My lord will come, and you have not earned the right to stand in his presence. Risk your head, otherwise." Her attention turned itself back to the depths of that newly reformed passage. Thunder rumbled overhead, and it made the dark oppressive, like a heavy mantle carried. Time seemed to crawl. The young dragon had watched the whole scene, continuing the chatting as long as her onee-san had asked her too. At the last man's death she had cringed softly, but they had to pay for their sins did they not. His words towards her big sister had stilled her cringing. As the objects had been shattered, she watched in awe of her onee-san. Her eyes sparkled as she watched the pristess work her magic. As she summonded the man she didn't recognize she stood back from him, sure not to go near him unless it was deemed okay by her onee-san. Watching the key and the priestess unlock the shadows she felt the air change. As the earth rumbled and the wind roared the dragon felt calmer than she would have thought she would have. As her Onee-san spoke to her she nodded, excited to meet the one that desired to meet her as well. She swept down to her knees and knealt awaiting his arrival. Yet, as the mist reached the ankles of the ones that took part in the ritual, it merely billowed past with all of the bite of a cool gust of wind. Then everything went quiet. As though the world had been hushed out of respect to welcome the lord's presence. At first, nothing but his footsteps could be heard, but slowly, a tall, imposing figure had formed in and stepped through the portal. One pale left hand raised to brush some dust off of the shoulder of his regal black coat. His hair, though still long, was in much finer condition than when his priestess had last seen it. And the raven strands fell elegantly about his head until they were inevitably pulled back into a low-tied ponytail to keep them out of his face. His dark, stormy grey eyes betrayed an excitement that his stony face denied before they closed and his chin raised slightly as he took a long, deep breath of the fresh air that he had so desperately longed for. "Tis stained with the aroma of blood...," he said in slight disappointment, the corners of his mouth turning downward temporarily in a frown. However, he lowered his head as he exhaled and turned, smiling slightly at his priestess, "...yet, tis in no way stale or corroded with time... Thou hast done well, my priestess." Having listened to the words spoken, and felt the changes in the atmosphere, Homura knew it was the approach of the one Onee-san called her lord. The young dragon stayed knelt down as taught and instructed by her older sister; careful to follow the practices she had been taught. With the utmost of respect she kept her head down, being very sure not to raise her eyes to his. Her hands sat folded delicately in her lap. She spoke softly, though not as quiet to need any strain to hear her, her voice filled with respect and gratitude for the meeting. "It is an honor to be in your prescience sir." "No," the lord called out, raising his hand to stop his priestess as she started to sweep away the blood and the bodies, "the aroma of thy work has awakened the hunger of the shadows. Let them feast. Tis been many a moon since they have had the chance to enjoy aught but rodents." Even as the lord spoke, the hushed whispers of the darkness filled the air as the black mist about their feet began to home in on the carcasses littering the area. Before long, the blood and corpses were completely swallowed up by the shadows and a series of sickening crunches like a large beast tearing into a fresh kill filled the air. Despite the horror of the moment, the lord paid it no mind at all as he turned his attention to the one that his priestess had called her "sister," his eyes narrowing slightly as they looked over the small girl as though looking for something the eye could not see. "Thou hast taken well to the lessons of thy sibling," the lord observed, a hint of amusement in his voice as his corners of his lips curled into a small smirk. As fast as the amusement arose however, it vanished leaving a cold scowl as his eyes continued to search the young woman. "Arise young one," the lord said, his tone implying that his words were more of a command than a request, "come to me, that I might look upon thee properly." Aska's eyes settled on her younger sister and pupil with a quiet observance. "Gracefully, little sister. Stand straight, small steps, eyes lowered, unless he says differently. Remain out of his personal space." She quietly reminded Homura in softly spoken Latin. A dainty hand reached out to straighten the kimono and obi expertly wrapped about the girl's small form. Now was the time that the girl could show all she had learned under the tutelage of her older sister. She would also be tested, shaped. Bent, not broken, perhaps. Homura nodded lightly at Aska's words, glad to have her big sister there to remind her. She stood gently, careful to make sure not to cause any wrinkles in her straightened outfit. Keeping her red eyes lowered she moved delicately towards him. Coming close enough for him to easily see her, better but heeding her sister's words to remain out of his personal space she stood, demur as she could be. The level of grace in her movements, while not the level of her sister's, showed that she had been practicing, and paying close attention to her studies. The klutz of a dragon had definitely gained some fluidity to her motions. Knowing she had not been asked to speak she stayed quiet until that was asked of her. Waiting to be told to raise her eyes or speak she awaited him too take his closer look. Having not been treated as a lord for such a long time after such a humbling experience, Kazuma had mixed feelings at how the women were treating him. However, he welcomed the humility and respect showed by the two women and smiled slightly as the young girl finally stopped a respectful distance away from him. "Thou hast learned VERY well," the lord noted and closed the rest of the distance between them until he was close enough to touch Homura, which he soon did as he reached down and gently lifted the girl's chin so that his stormy grey eyes could meet her own, "do not avert thy gaze..."
For one long, possibly awkward moment. He would simply gaze into the girl's eyes, frowning as he searched for something within them. However, the awkwardness would soon begin to fade as something small sparked within Homura, entrancing her and forcing her to gaze ever deeper into the thunderstorm within Kazuma's eyes. Soon, she would be able to neither move nor look away as the lord smiled and turned his head slightly to address Aska, though his eyes would not leave Homura's. "thou hast prepared her well my dear; the change will not destroy her, though she may still suffer as the darkness takes hold. Art thou sure thou wishes to go through with this?" Kazuma's voice would sound muffled and far away to Homura as a new voice would speak within her mind. A voice very similar to those of the darkness that she had heard before whispering things that she could not yet understand. Aska cleared her throat softly, and added her own admonishment to Kazuma's, not naysaying his words, but making it clear the girl's training. "You may meet his eyes this time, but always wait for permission for such a thing, little sister. You do not meet the eyes of the one you serve unless beckoned to do so." Her hand fell to the girl's shoulder lightly, and she remained silent for long minutes as she calmly weighed the next actions and their consequences. "She is not to be broken. Brought into her new ways of thought, yes. But I do not want her core changed. It must remain intact. You would never dishonor her, so I do not fear that. Make her into the truth of what she is, my lord. This is her path." There was little doubt to the lord that, with the words chosen, she had every plan to shape the girl into a young priestess. The only way that it appears Aska is seeking to help is making sure the girl does not fall in some way. She's aware that the girl is prepared, had been so by her own hand. She, a servant of the dark, knew how to foster such a thing in another, and gain the trust. She had begun shaping the fire dragon from day one. Any failure would not be hers. 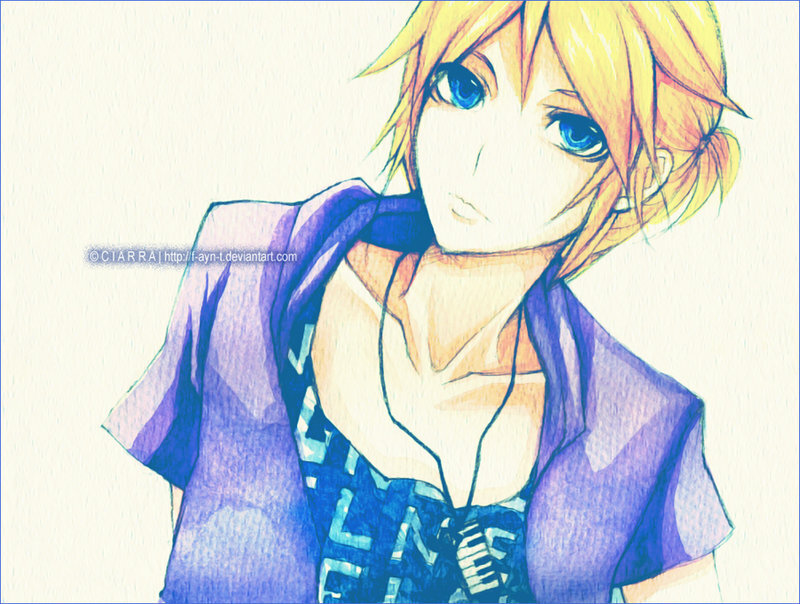 She stands still beside Kazuma, calm lavender eyes fixed on the girl and watching the process. It was different for all, but certainly, it had been so much less dramatic for her. But there were good reasons for that. Reasons none knew, and it would remain that way, until the information was deserved or earned. Aska's patience was infinite, and she'd wait until the dragon took steps her way before she said or did anything. Still, she placed herself slightly ahead of Kazuma, unsure how the young dragon would take her transformation, and knowing that her own training and magicks would have heightened effects on the girl, due to their time together. Imprinting, they called it. Like duckling to mother. As the lord's face drew closer and closer to hers her instincts were to pull away, and look away. However unable to do so, merely left her flushing and shaking softly. The last thing she noticed before the words rang through her was the scent that clung to the lords clothes. Then she was falling, falling through nothing but black and darkness. After what seemed like an eternity to the dragon she landed softly on her feet. Looking around she saw nothing but darkness. "Hello?" she called out softly. Trembeling as she walked a few steps she felt a heat, and like a moth to flame was drawn to it. As the darkness broke what she saw made her pause for a moment. A world of black flames, and a dark figure. Taking a moment to gather her wits she stepped forward, to face the figure. Standing exactly her height the fire dragon found face to face, with herself. She stumbled back lightly, her ruby eyes falling on the onyx ones of the other. "Who....who are you? You look like me?" The other form laughed, "I look like you? Of course I do, I am you, well the real you. I am your darkness, the daughter of dark flame, the true you." The black eyes met the widened ones of the dragon. "You are a dragon, a dragon of fire, there is an inherent destructive nature in you. Why not embrace who you truly are?" Behind the dark eyed girl a giant jet black dragon that could easily decimate an armada without a second glance roared, shooting a stream of black fire around the two. A crooked grin crept across her face as she stepped closer to the fire dragon. "I do believe it is time for me to make my own appearance. Power, darkness, destruction, all can and will be ours. We are not weak, and never will be looked at in that way again." 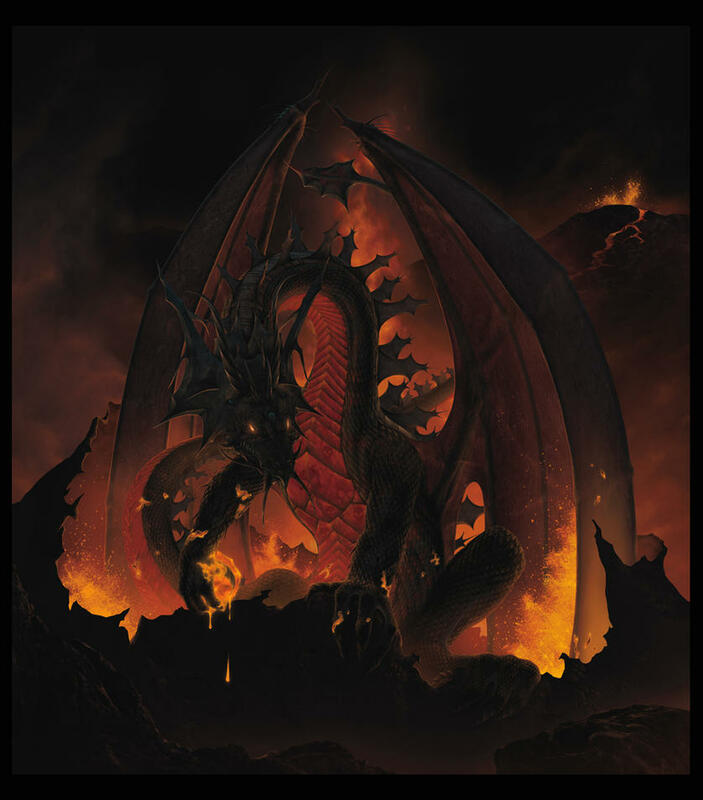 The dark flames swirled out around the red eyed dragon, dragging her down into an abyss of dark fire. The last thing she saw was the crooked smile of her dark counterpart. "Sleep now daughter of flame. The darkness is not to be feared, but to be embraced, and that is exactly what I plan to do." Ruby eyes closed as the darkness locked her away in slumber. As the darkness crumbled away from the young dragon her eyes opened revealing deep blood red irises. The power coursing through her body, felt right, like it should have always been there. Daintily she brushed the remaining ash from her kimono, making sure she was presentable for the lord that awakened her true self. Careful to abide by her training and not meeting the lord’s eyes she took delicate steps towards the two, drawn to the priestess, her Onee-san. The lord blinked at the dragon's subdued transformation. If memory served him correctly, most others subjected to the same transformation felt a rush of power so overwhelming that they simply had to release it. Perhaps he triggered the transformation incorrectly? The lord would blink again and shake his head, stifling a laugh at his own doubt. No, that couldn't be it. Obviously, this young one had controlled her powers well. An admirable quality. Aska had trained her well. Once the young woman's transformation was completed and it's success confirmed, the lord simply tosses Aska a look that says "it is done." And wordlessly walks over to one of the ancient devices Aska used to kill her sacrifices during the ritual. Though her was already familiar with the workings of the device, he pretended to examine the intricacies of the machine to give the two women a bit of privacy. Surely they would want to reaffirm their bonds after such a thing had ended. And perhaps even forge some new ones.